Margaret was born on the 31st May 1443 at Bletsoe Castle in Bedfordshire. Her parents were Margaret Beauchamp of Bletsoe and John Beaufort, 1st Duke of Somerset, grandson of John of Gaunt, 1st Duke of Lancaster, and his mistress (and eventual wife) Katherine Swynford. Margaret was an only child. Although a 1397 act of Parliament legitimized the children of John of Gaunt and Katherine Swynford, but in 1407 Henry IV, while recognising the legitimacy of his Beaufort half-brothers and sisters, declared that they could never inherit the throne. Margaret was married four times: c 1450 to John de la Pole, a marriage which was dissolved in 1453 (some say that the marriage never happened and was just a betrothal); 1453 to Edmund Tudor, 1st Earl of Richmond, eldest son of Owen Tudor and Catherine of Valois and half-brother of Henry VI; 1462 to Henry Stafford, son of the 1st Duke of Buckingham; and finally in 1472 to Thomas Stanley, 1st Earl of Derby and the Lord High Constable and King of Mann. Margaret had just one child, Henry VII. She gave birth to him at the age of 13 and his father was Edmund Tudor. Margaret was a powerful lady and was a key figure in the Wars of the Roses between the Houses of York and Lancaster. She actively supported her son Henry Tudor’s claim to the throne and was able to persuade her then husband, Thomas Stanley, and his brother to swap sides and support Henry at the Battle of Bosworth Field. Henry defeated Richard III and became Henry VII of England. Margaret and Elizabeth Woodville co-plotted the marriage of Henry, Margaret’s son, and Elizabeth of York, Elizabeth Woodville’s daughter by Edward IV. Margaret was the Countess of Richmond and Derby but, after her son’s victory at Bosworth, was referred to as “My Lady the King’s Mother” and refused to accept a lower status than the queen consort, Elizabeth of York. David Starkey writes of how Arthur, Prince of Wales, inherited his grandmother’s Beaufort looks: hooked nose, hooded eyes, bags under the eyes and a slim build. She took an active interest in education and she established the Lady Margaret’s Professorship of Divinity at Cambridge University, refounded and added to God’s House, Cambridge, turning it into Christ’s College, and her estate founded St John’s College, Cambridge. The Queen Elizabeth’s School, formally Wimborne Grammar School, came about as a result of her intention to build a free school in Wimborne, Dorset. John Fisher, Bishop of Rochester, was Margaret’s friend, political and spiritual adviser, and executor of her estate. He was eventually executed for treason by her grandson, Henry VIII. The Beaufort motto was “Souvent me souviens”, “I remember often”. She died on 29th June 1509 at the age of 66, a great age for a Tudor. Margaret died just four days after enjoying the coronation celebrations of her grandson, Henry VIII, and Henry Parker, Lord Morley, who acted as her cupbearer at the coronation ceremonies, reported that “she took her infirmity with eating of a cygnet”. 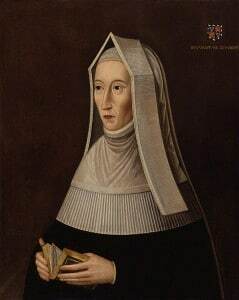 Lady Margaret Beaufort’s resting place is at Westminster Abbey in London, in the south aisle of Henry VII’s Chapel. Her tomb was sculpted by Pietro Torrigiano and features a portrait effigy of Margaret dressed in traditional widow’s dress, her head resting on two pillows decorated with the Tudor badge, her hands raised in prayer and the Beaufort family crest at her feet. The Latin inscription, written by Erasmus, translates as “Margaret of Richmond, mother of Henry VII, grandmother of Henry VIII, who gave a salary to three monks of this convent and founded a grammar school at Wimborne, and to a preacher throughout England, and to two interpreters of Scripture, one at Oxford, the other at Cambridge, where she likewise founded two colleges, one to Christ, and the other to St John, his disciple. Died A.D.1509, III Kalends of July [29 June]”. Was this meant to refer to Henry VII? Just wondering, as it seems to be describing Margaret’s son more so than her grandson, Henry VIII..or maybe Arthur? Well spotted, I meant to write Arthur there as Starkey is of the opinion that Henry favoured the Yorkist side of his family in looks and Arthur looked like Margaret. Henry was actually slim when he was young – tall, slim and very good looking. Margaret delivered a child at the age of 13 and never conceived again during her two subsequent marriages. I suppose one can speculate that giving birth at such a young age damaged her reproductive system. And looking at Edmunds birthdate, 1431, makes him 12 years older than she. If she was around 10 when she married him, he was 22. He died at 25 and she was a widow at 13. Hard to fathom. She looks very severe I should imagine she was a bit like Queen Mary , ( George V1s mother), very regal and every inch a queen. I love Margaret’s story. She was a formidable woman, for sure. I tell students all the time-don’t strive to be like Kim Kardashian or one of the girls from 16 and Pregnant. Pick a woman who is or was strong, independent, and resourceful. I’ve had several absolutely fall in love with Margaret after reading about her. She was strong and very resourceful, she had to be being made pregnant at the tender age of thirteen, her husband was extremely selfish but he was desperate for an heir, her life was fraught with danger and yes she is a good example for women to follow, she centred her life around her son and she lived to see her dream come true, he was crowned King Of England yet that dream must have seemed so far off when she found herself widowed at pregnant whilst not yer fourteen. Was Margaret Beauchamp or Kathryn Swynford her mother? Margaret Beauchamp. She was descended from Katherine Swynford though – great-grandaughter.